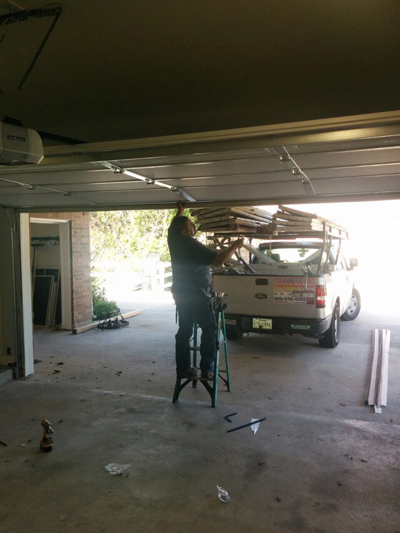 By garage door panel replacement we mean the replacement of one or two panels of sectional doors. These types of doors consist of several panels, which are connected with hinges. When one or two of them are damaged, there's no need to replace the whole door. The ruined panels are replaced by removing the hinges and installing the new panels. Bottom panels are the ones which get ruined more often. The lower parts are usually hit by cars and wear faster. When having sectional doors, one has the opportunity to save money by only buying and installing the damaged parts of the door. The panel replacements must be a perfect match to the existing garage door. It is not hard to find such a replacement as manufacturers usually keep stocks of all models for many years. The replacement of the panel is not easy though, and must be done by a professional.